During the cold winter season when we all rug up, it's easy to forget about our grooming needs as we hide our hairy body and legs under thick layers of warm clothing, leggings and tights. This is all well and good until an unexpected event comes along that requires us to frock up and bare some skin as was the case recently for me. Whilst I'm not a hairy person, the dark hairs I have are very noticeable against my winter skin so when I had to rush with the razor to de-fuzz, the results were less than satisfactory to say the least. The lesson of my story is to always be prepared for the unexpected no matter the season by maintaining your regular grooming routine. My preferred choice of at-home hair removal has always been epilation because it provides long lasting results comparable to waxing without the mess, skin irriations and unlike shaving, doesn't cause nicks, cuts or give razor bumps. For the past 3 years, I've relied solely on my trusty Emjoi BareBody Go (and before that, its predeccesor the Emjoi Gently Gold for 4 years) for smooth hair-free skin but that went kaput on me recently and I was forced to hunt for a new epilator. 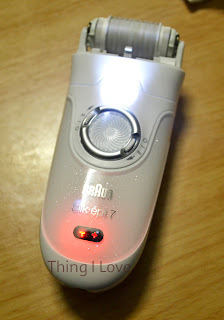 I did some research and noticed that technology advancement had come a long way since I bought an epilator and the new devices now come with exciting new fang-dangled features which I'm always a sucker for. So you can imagine my excitement and heightened expectations when I was given the opportunity to try out one of these hi-tech epilators. I love that the device is fully charged within the hour and charging indicator lights change from blinking to staying on constantly gives you the visual cues to let you know when it's ready for use. 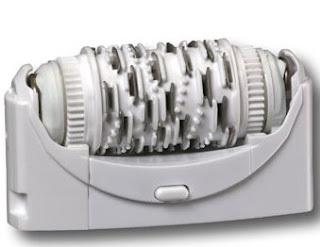 Each charge gives about 40 mins of cordless use - more than enough time to work on entire legs and underarms for most. When it's running low on power and starts to slow down, it will start blinking on red on the (-) sign and when the (-) sign lights up continiously, then it's time for a charge. Comes with 5 inter-changeable caps including a shaver/trimmer head to let you to use the epilator on all body parts including your face. The Shaver head and trimmer attachment even allows you to trim and groom your lady bits to keep everything under control or help make epilation less painful by shortening the hairs first before removal. My favourite attachment is the high frequency attachment which vibrates and pivots to adapt to the body's contour for closer skin contact which really minimise the discomfort and pain during epilation. As I'm farily used to epilation after all these years, I barely felt more than tiny tugs during use giving me what is by far the most comforable experience I've had with epilation. I won't lie and say its completely pain-free, but it is something that is very tolerable and with use over time, you your skin numbs out with the high speed tweezing and don't feel it as much. 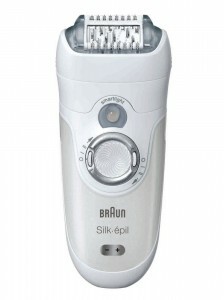 I'm normally farily pain tolerant and would rate epilation using the Braun Silk Epil 7 at a pain level of 2 for legs and 3 or 4 on facial/bikini areas (with 0 being no pain at all and 10 being OMGWTF-searing hot, throbbing pain). The most important thing to remember is any discomfort experienced is generally very brief so if you can tolerate waxing (which I think is slightly more painful), you will definitely be able to use this. Picks up hair a short as 0.5mm with the latest close grip technology meaning that you don't have to wait for hair to grow much to remove them and with results lasting up to 4 weeks, you will have silky skin for longer. Another plus is that there are less hair re-growth and any that do grow back are be finer and softer. Has a dial-style on/off switch that rotates to turn on and provide 2 speeds, 1 for gentle (slower) or 2 for efficient (faster) epilation. I always turn it to the higher speed as I find faster tweezing leads to less discomfort over time as any pain numbs out with the high speed. Tip: Epilation can sometimes cause ingrowns so be sure to keep up with the regular exfoliation to help the hair follicle break out of the skin when they grow back, ready for the next epilation session. Another standout feature is the ability to use this wet or dry - yes, you can take it to shower with you and epilate under soothing warm running water to further lesson any epilation pain. This is especially great for sensitive areas like the bikini or facial area. In fact, I'm was so impressed with the epilator I even allowed it to go near my face (which I've never done with my Emjoi) to remove the hair above the sensitive lip area and although I felt slightly more pain in that area, the hair was removed in no time that the soreness didn't even havr time to register. Cleaning this is a cinch as you just run this under running water to wash off all the hair and dead skin cells, dry it off and viola, ready for the next shave. Love the build-in ultra bright white smart light just above the controls that automatically turns on when you switch on the device to give better visibility and help show up the areas of hair you might have otherwise missed. Is travel friendly with the compact universal voltage charger and a waterproof draw-string pouch to carry everything neatly so you can take it with you anywhere you go. Made in Germany and comes with a reassuring 2 yr warranty - longer warranty periods is something I always look for when buying gagets as its a sign of the device's quality and indication that it won't die within a few short months. It also means that if it does break down during the warranty period, you can always get a replacement or refund without any added costs (just make sure you keep that receipt handy when claiming). If are looking for fast at-home hair removal with lasting results that is gentle and comfortable to use or need to upgrade from your current epilator, you can't go past this high-tech gadget that has all the features you ever want want or need. It truly is the the best in its class and gives the ultimate epilation experience, surpassing all my epilating expectations. 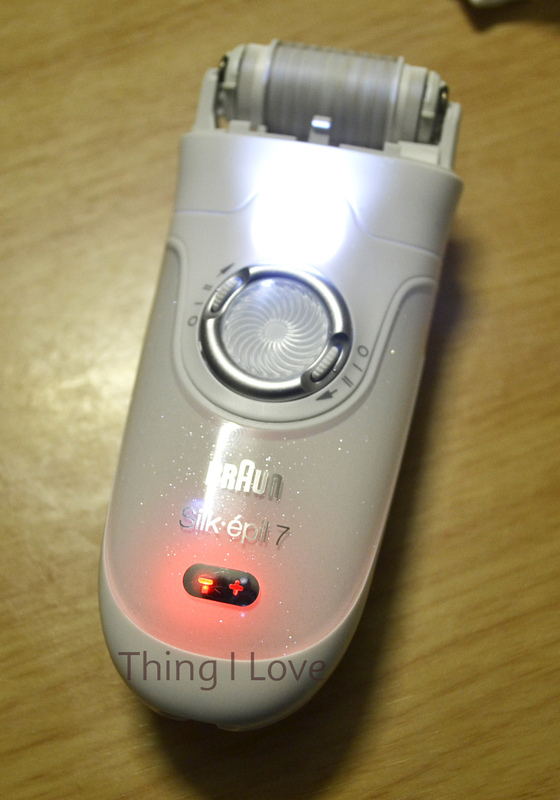 In fact, I can't see myself needing or using any other epilator. Update: Don't forget to read the latest model Silk Epil 7 Dual Epilator and its comparison with the Xpressive Pro model here. Looking for more reviews: see it in action at Akisa's review here, Kimmi from PlasticDairies here or Ponikuta's here. RRP A$208.95 at leading department stores, the Shaver Shop and selected electrical outlets. I would like to know the results after you done on your upp lip area, did it grow back dark and thicker? Also for 1st timer, do I need to shave the arm area hair shorter before I begin, tks. No it did not grow back thicker or darker. As with waxing, epilation is total removal of the hair from the follicle so regrowth is finer and it took about 3 weeks before mine grew back at all. You probably don't need to shave the hair on your lips but in other areas, I would advise to get a pair of scissors and trim hair down to less than 1cm for easier removal (especially under-arms or bikini areas where hair can be quite long). What is the price of this device? Also, in a nut shell, the main difference b/w the pro and dual version is the shaver right? The Australian RRP of the product is in the post but you can normally find the device on sale and sometimes Braun also does a cashback offer which allows you to buy the product for alot less. In a nut-shell, the pro has more attachment heads. The dual only has 2 attachments (one for shave and epilate, and another for epilation only), The Pro has 4. The body of unit are the essentially the same with minor colour differences. It depends on your preference and how you see yourself using the epilator that influences which one you want to get more. Hi My - thanks for your question. 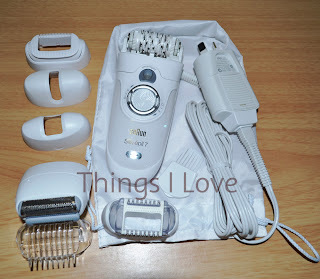 I think if you want to remove hair the quickest way, then the Silk Epil dual epilator (with razor) is the one to get as it can shave and epilate hair at the same time for the smoothest skin. You will have to buy replacement heads as the razors will get blunt over time though.